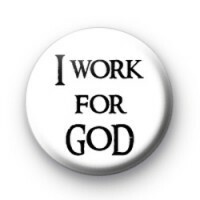 I work for god badge in white with black text which reads I work for God. These religious badges are popular with churches and church groups & are often bought by our Christian and Roman Catholic customers. Perfect to give out in religious education classes. We have a range of Religious and God/Jesus themed badges to celebrate your faith. 1-inch badge made in the UK.